Home » Aktualności » The best way to get to know the various districts of Gdańsk? Local Guides! J.R.R. Tolkien’s relationship with Poland, Gdańsk and the Zaroślak estate; the birds of Dolne Miasto; the architecture of Nowy Port; traces of the Ferber family in Orunia; the history, architecture, flora and fauna of Oliwa, Slow Art Day in Zaspa. These subjects mean that spring is finally here, and with it – another season of open lectures and walks guided by Local Guides. This year, Oliwa has joined the group of districts, where the history of Gdańsk is recounted by the inhabitants themselves. For a detailed schedule of lectures, go to: www.ikm.gda.pl/lokalni-przewodnicy-i-przewodniczki. Local Guides love Gdańsk and are passionate about the history of their respective districts. They share these stories with inhabitants and tourists alike during summer walks – taking part is free for all. Before that, between April and June, they build on their practical and theoretical knowledge during open lectures. Anyone with an interest in local stories, the district’s past, its inhabitants, nature and architecture are welcome to come along. “We’re looking forward to our 8th summer with Local Guides. We started out with Zaspa and guided walks around the Monumental Art Collection, and today we can boast the addition of Oliwa, our sixth district, where the inhabitants talk about their localities. The programme of lectures, meetings and guided walks is very extensive. I hope that many people will want to get to know this district better and will join Local Guides in the summer to show alternative routes around Oliwa,” says Barbara Sroka from the City Culture Institute. In April, Prof. Andrzej Januszajtis will introduce participants to the history of streets in Dolne Miasto. During the bird-centred walk, Ewelina Sobańska and Piotr Kamot will teach participants to distinguish between various feathered inhabitants of the district. May meetings will take us back to when patients of the hospital on Śluza Street were taken care of by the Sisters of Mercy of St. Borromeo, and the Mniszech Palace on Długie Ogrody Street was the seat of the garrison commander of the Gdańsk fortress. The series of lectures will end in June, with a narrative on the Abegg family’s contribution to Dolne Miasto. Lecture venue: Łaźnia CCA, 1 Jaskółcza St. Start of the ornithological walk: by the red tram next to Cafe Zajezdnia on Wróbla Street. District-based walks and talks will be held in Orunia for the third time. “We are going to discover the history of important industrial facilities that once operated in the area. The organs in St. John Bosco’s church will no longer hold any mysteries for us, and neither will the underground ‘Orunia Temple of Water’. We will take a look at plans to build the ‘Upper’ Orunia estate. We will follow the history of the Ferber family and their influence on the development of Lipce. We will recall the sad part of the penal camp in Maćkowy. A cycling tour will take us around interesting locations near Orunia, showcasing the tourist potential of the area. Equipped with new knowledge, we will embark on trips around the journey during the summer holidays,” enumerates Aleksandra Abakanowicz, Local Guide around Orunia. Lecture venue and the start of the walks: Stacja Orunia GAK, 9 Dworcowa St.
“This spring will be all about photography: we are going to learn about the plans to create a chronicle of Nowy Port, we will discover little-known aerial photographs of the district taken during the way, and mobile photography enthusiasts will find out what Nowy Port looks like on Instagram,” says Katarzyna Werner, Local Guide around Nowy Port. Memories of the district’s past will be brought to life during walks around Nowy Port’s cemeteries. Former employees of the port and Baltona will talk about the bloom of trade and the district’s resourceful inhabitants. Fans of walks and architecture will have a chance to discover the western part of the Nowy Port. Participants of the guided walks will also visit places that are important for the local street culture. “Preparations for the fourth season of guided walks around Nowy Port will conclude in the tram depot, with a ride on a historical tram,” adds the guide. Lecture venue: Dom Sąsiedzki at 49 Wyzwolenia St., guided walks begin in front of the former Maritime Culture House, 15 Marynarki Polskiej St., meeting about the district’s past: Perła Bałtyku – Bawialnia, 53/54 Oliwska St.
“We are going to delve deep into the oldest history of Gdańsk, Biskupia Górka and the Chełm village, and – like each year – we will visit places that are not available on a daily basis, such as the fortifications and the Paul Beneke Youth Hostel. We will also talk about the flora and fauna of the Biskupia Górka forest. Last but not least, participants will also discover the connection between Poland, Gdańsk and the Zaroślak estate and John Ronald Reuel Tolkien, author of the unique fictional land, which has enchanted generations of readers around the world,” says Magdalena Kamrowska, Local Guide around Biskupia Górka. Lecture venue: Gdańsk School of Higher Education, 24b Biskupia St.; start of the walks: 2 Menonitów St., next to the Pentecostal Church. Oliwa is a beautiful district, whose atmosphere, architecture and nature have for years attracted inhabitants and tourists to take long walks. Either classical ones, around the Oliski Park or Pachołek Hill, but also to Ewa’s Valley or Valley of Joy. The area, immortalized in a number of novels by Stefan Chwin, Paweł Huelle and Günter Grass, will now be the subject of stories told by Local Guides. The rich programme of lectures held by experts on the district covers its history (it used to be a Cistercian village) and development, the biographies of famous inhabitants, legends, architecture and urban development, places important for various religions: the Oliwa cathedral, mosque and synagogue and the Oliwa cemetery. 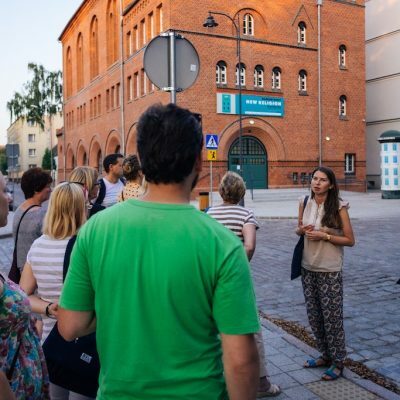 Lectures and walks are predominantly aimed at those participants, who would like to share their knowledge and help others discover this part of Gdańsk. Starting from this year, each passionate fan of Oliwa can become a Local Guide around the district! Lecture venue: Oliwa Town Hall of Culture, Scene Hall, 25 Opata Jacka Rybińskiego St. Slow Art Day, this year titled ”Das Mural”, will open the season of walks with Local Guides around the Monumental Art Collection in Zaspa. The works were created by artists from all over the world, including a large representation of German artists. “Come take a walk with us and find out how German works in the collection relate to the surrounding reality, what is their place within the historically complex space of Zaspa and whether they would have the same impact on the walls of Berlin,” encourages Jarek Orłowski, Local Guide around Zaspa. Slow Art Day is an initiative under which museums and galleries help their guests focus on five selected works from their collections. Das Mural. German murals in the Monumental Art Collection in Zaspa. 21 April, 12:00 noon. Start of the walk: Plama GAK, 11 Pilotów St.
District organizers: Biskupia Górka Association, Dolne Miasto Storytellers Association, From Liberation to Freedom Group, Stacja Orunia GAK, Plama GAK, Fundacja Wspólnota Gdańska. Partners: WAGA Association, Gdańsk School of Higher Education, Łaźnia CCA, Oliwa District Council, Oliwa Town Hall of Culture, www.staraoliwa.pl.